These are the youngest newcomers to our business. 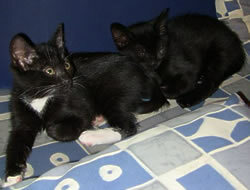 As small kittens, born at the same day when our beloved cat "Sternchen" (Little Star) passed away during an accident, they joined our family in August 2009. The siblings are the tomcat Merlin, a black cat to the core, and the pussycat Floeckchen (meaning Little (Snow-)Flake), that could not completely decide if she wanted to be black or not. So her whiskers and her feet got white as if she stepped through snow. Both are filling our house with joy and happyness and remind us everyday that there is more in our lives than just work.